Is Anti Slip Epoxy the right choice? More and more we are being called out to sites where the pedestrian surface was coated with Anti Slip Epoxy with a broadcast grit added, and after a period as short as 18 months have become very slippery again. After many years in this risk reduction industry a few things have become glaringly obvious when Epoxies are used inappropriately or installed poorly as a solution for slip fall prevention. Correctly laid and with even grit distribution Epoxy flooring is a great way to increase traction. Some of the surfaces we have tested over the years have provider very high anti slip characteristics some up to an R13 ramp rating using a coarse broadcast grit. Hardness is one of the features that make Epoxy flooring an attractive option it’s tough and almost bulletproof for factory floors. Unfortunately this hardness is the same feature that makes it very punishing on feet and joints and muscles if you’re on it for long periods during the day. Unlike some of its competitors who maintain a level of anti slip safety once the grit has ground down, the self-leveling nature of the Epoxy creates an incredibly smooth glossy finish with characteristics similar to glazed ceramic tiles, with BPN (British Pendulum Number) readings to match. We have tested 2 year old Epoxy installations reading a .23 wet BPN which is considered a HIGH RISK surface. Floating the Epoxy surface is just one part of a good safe installation. With increasing industry competition in this type of flooring it’s no surprise to see shortcuts and rushed applications. Many installations we are call out to treat are simply not appropriate for the environment. 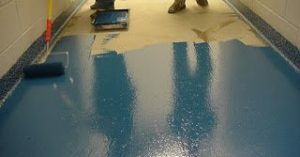 Typically, Epoxy flooring was developed for Light Industry where a chemical resistance was required. Like a lot of products it morphed into a one size fits all solution, sadly that’s where the inappropriate use of a great solution started to create consumer dissatisfaction. It is important to point out that “Friction Systems Australia does not supply or install Epoxy solutions”, our business is to find and apply viable options to make these surfaces safe again for pedestrian traffic.